183 Marlborough is located on the north side of Marlborough, between Dartmouth and Exeter, with 181 Marlborough to the east and 185 Marlborough to the west. 183 Marlborough was designed by Peabody and Stearns, architects, and built in 1882 by Andrew Anderson, carpenter, and Vinal & Dodge, masons. 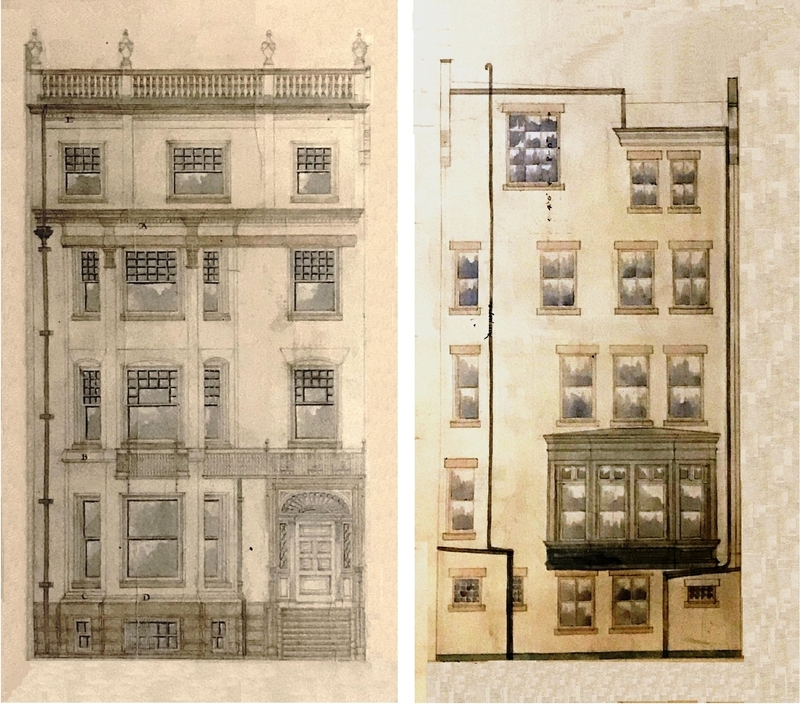 Two years after designing 183 Marlborough, Peabody and Stearns designed 185 Marlborough in a complementary style. While different in almost every detail, the massing and arrangement of the façades creates a unified effect, aided by similar (but not identical) balustrades. 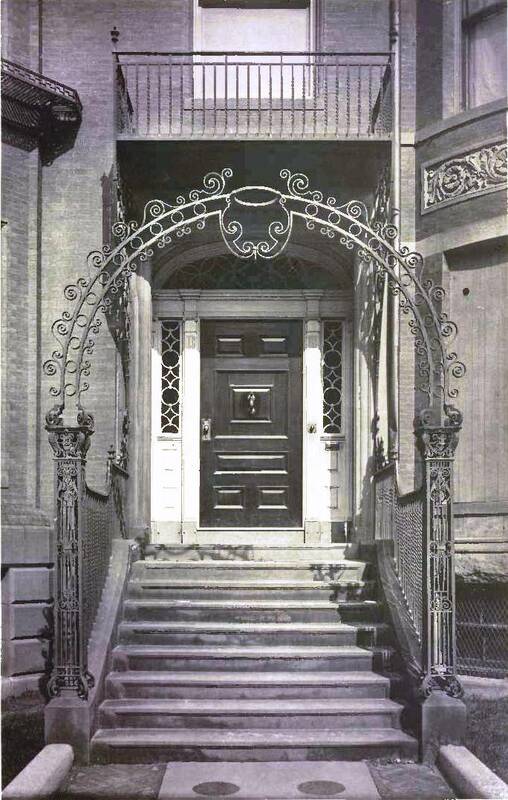 183 Marlborough is distinguished by a wrought iron arch at the base of the entrance stairs and a wrought iron balcony over the entrance (both of which were original to the design). 183 Marlborough was built for retired merchant and banker John Endicott Peabody and his wife Gertrude (Lawrence) Peabody. They previously had lived at 80 Commonwealth. He is shown as the owner on the original building permit application, dated May 31, 1882. The house was owned by a trust established under the will of Gertrude Peabody’s father, James Lawrence, for her benefit. The land for 183 Marlborough was purchased by Gertrude (Lawrence) Peabody’s trust on May 2, 1882, from attorney Henry Childs Merwin who had purchased it from the estate of Gertrude (Lawrence) Peabody’s father, James Lawrence. It had been part of a larger parcel that James Lawrence and Thomas Jefferson Coolidge had purchased on May 31, 1872, from the Commonwealth of Massachusetts (T. Jefferson Coolidge sold his interest in the land to James Lawrence on December 28, 1872). Click here for an index to the deeds for 183 Marlborough. Plans for the house are included in the Peabody and Stearns Collection in the Boston Public Library’s Arts Department (reference PS/MA.121). The plans refer to a June 1, 1882, contract for constriction of the house. The design of 183 Marlborough reflects the specific needs of John and Gertrude Peabody. They had married in June of 1878 and had two young children: Marion Lee Peabody and Harold Peabody. Accordingly, there was a “baby carriage closet” located conveniently off the front stair hall on the first floor, and two nursery rooms and a day nursery room on the third floor. John Peabody was an amateur painter, and in the rear of the fourth floor there was a studio for his use with a large window to catch the northern light (that window either never was built or subsequently has been reduced in size). The rear wall of the house was designed to extend further north than its neighbor to the east. There was a brick ell on the ground level, above which the wall was built at an angle with windows on each floor. Click here to view the original plans for 183 Marlborough. Gertrude Peabody died in May of 1883, not long after the Peabodys moved to 183 Marlborough. In her will, she left the house in trust for the benefit of their two young children, Marion Lee Peabody and Harold Peabody. John Peabody and their children continued to live at 183 Marlborough. During the 1885-1886 winter season, they were living elsewhere an 183 Marlborough was the home of cotton merchant Francis Williams Sargent and his wife, Jane Welles (Hunnewell) Sargent. They previously had lived at 8 Gloucester. They also maintained a home in Wellesley. They had moved by the next season, and by the 1887-1888 season were living at their newly built Boston home at 40 Hereford. John Peabody and his children had resumed living at 183 Marlborough by the 1886-1887 winter season, and in August of 1887 he remarried to Martha Prince Whitney. The Peabodys continued to live at 183 Marlborough during the 1892-1893 winter season. They then traveled in Europe for the next three years, where he studied painting and design. Their son, Samuel, was born in August of 1894 in Ouchy, Switzerland. While they were away, 183 Marlborough was the home of Henry Denison Burnham and his wife, Johanna Barbara (Heckscher) Burnham. They had lived at 293 Beacon in 1892. He was a trustee of estates. They continued to live at 183 Marlborough during the 1895-1896 winter season, but moved thereafter and by the 1897-1898 season were living at 315 Dartmouth. John and Martha Peabody resumed living at 183 Marlborough until the 1899-1900 winter season, when they again lived elsewhere, probably traveling abroad, returning for the 1902-1903 season, when they lived temporarily at 86 Marlborough). During the 1899-1900 winter season, 183 Marlborough was the home of ornithologist John Eliot Thayer and his wife, Evelyn Duncan (Forbes) Thayer. Their primary residence was in South Lancaster. By the 1900-1901 winter season, it was the home of Charles Ritchie Simpkins and his sister, Mabel Simpkins. They had lived at 239 Marlborough during the previous season. In June of 1902, Mabel Simpkins married George Russell Agassiz, the son of Alexander Agassiz, developer of the Calumet and Hecla copper mines in Michigan, and grandson of noted zoologist and professor, Jean Louis Rodolphe Agassiz. After their marriage, they lived in Cambridge. 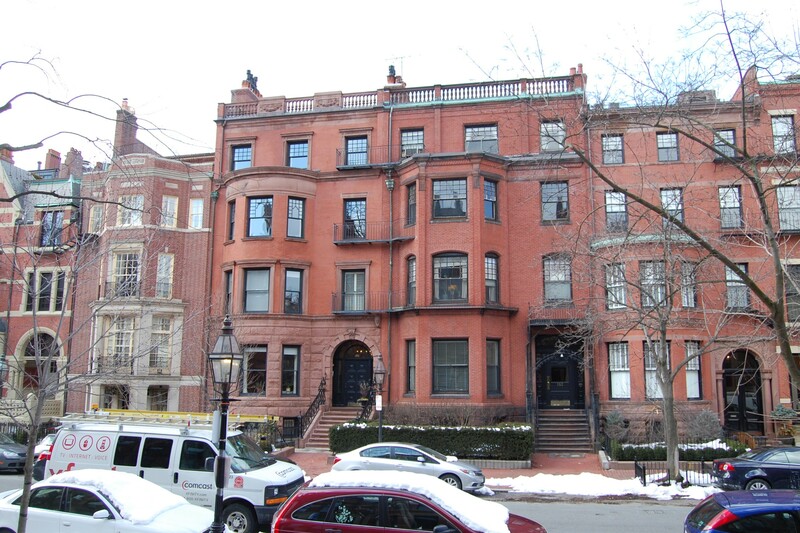 Charles Simpkins moved to the Somerset Club at 41-43 Beacon, and 183 Marlborough became the home of Bayard and Ruth (Simpkins) Thayer (listed in the “too late for entry section” of the 1903 Blue Book). They previously had lived at 32 Hereford. Ruth (Simpkins) Thayer was the sister of Charles and Mabel Simpkins, and Bayard Thayer was the brother of John Eliot Thayer, who had lived at 183 Marlborough during the 1899-1900 winter season. By the 1903-1904 winter season, the Peabodys were living at 183 Marlborough once again. In October of 1904, Marion Peabody married to her first cousin, James Lawrence (the son of Gertrude (Lawrence) Peabody’s brother, James), a cotton broker. After their marriage, they lived in Milton. 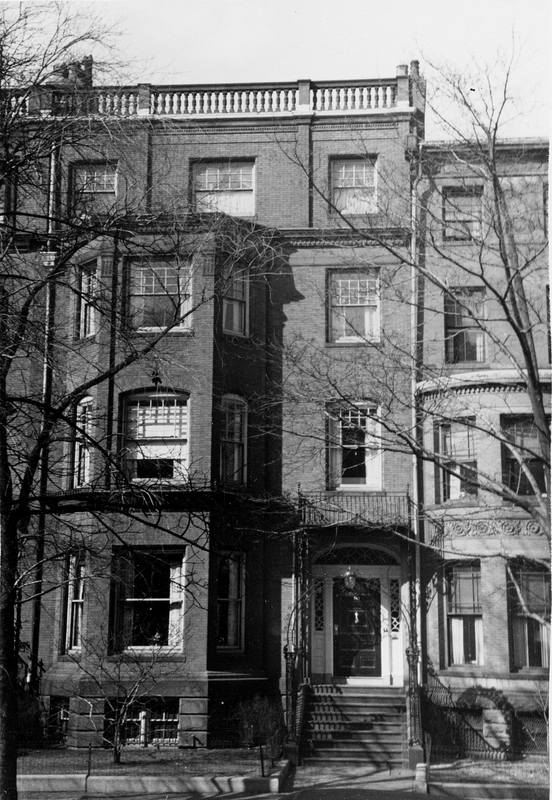 John and Martha Peabody, Harold Peabody, and Samuel Peabody continued to live at 183 Marlborough during the 1904-1905 winter season, but moved thereafter. By 1907, John and Martha Peabody and Samuel Peabody were living in Cambridge. During the 1905-1906 winter season, 183 Marlborough was the home of Albert Ivins Croll, a yarn dealer, and his wife, Sarah Helen Merrill (Knowles) Croll. They also maintained a home in Manchester. They had lived at 285 Commonwealth until 1903. They had moved from 183 Marlborough by the 1906-1907 season, probably making Manchester their year-round home; by the 1907-1908 season they were living at 410 Beacon. In May of 1906, Harold Peabody married his second cousin, once removed, Marian Lawrence (the daughter of Bishop William Lawrence; Marian Lawrence’s grandfather, Amos Lawrence was the brother of Harold Lawrence’s great-grandfather, Abbott Lawrence). After their marriage, they lived in Milton and then at 302 Berkeley. On June 8, 1906, 183 Marlborough was purchased from the trusts established by Gertrude Peabody for Marion (Peabody) Lawrence and Harold Peabody by Henry Wheeler. He and his wife, Ellen (Haywood) Wheeler, made it their home. They previously had lived at 289 Marlborough. They also maintained homes in Orford, New Hampshire, and North Haven, Maine. Henry Wheeler was an attorney. He also served as president of the Nashua & Lowell Railroad. 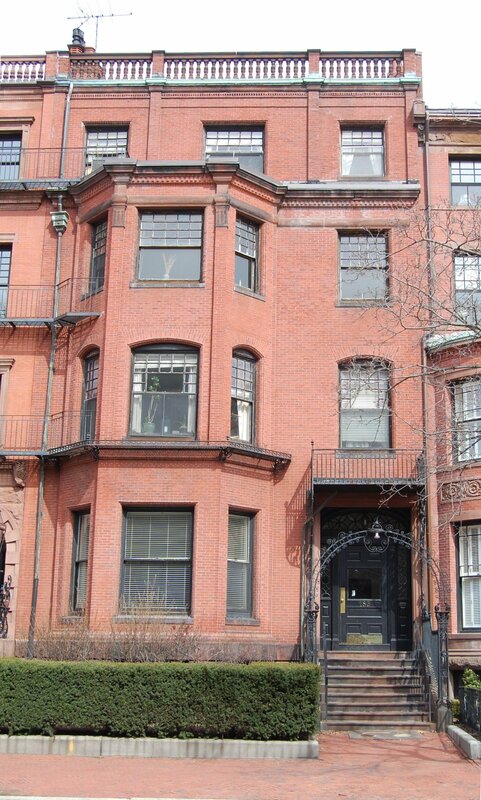 He died in June of 1945 and Ellen Wheeler continued to live at 183 Marlborough until about 1949. On December 7, 1949, 183 Marlborough was purchased from Henry Wheeler’s estate by Michael (Max) Lilly of the Lilly Construction Company. In February of 1950, he purchased 185 Marlborough. 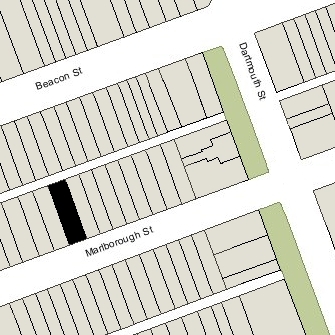 In December of 1949, he filed for (and subsequently received) permission to convert 183 Marlborough from a single-family dwelling into nine apartments. 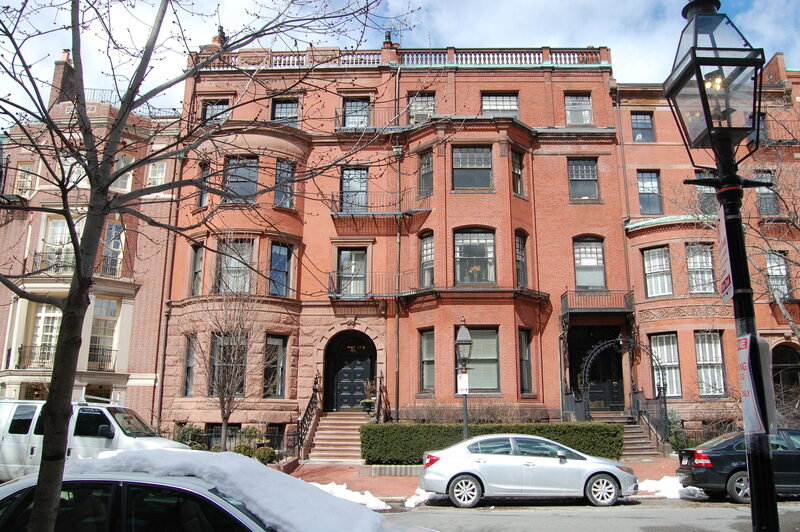 He filed an identical application for 185 Marlborough. In February of 1950, he amended each application to increase the number of units to ten. The amendment was approved, but subsequent permits for 183 Marlborough continued to reflect the 1949 application and show the legal occupancy as nine units. On April 30, 1951, Michael Lilly transferred 183 Marlborough to 183 Marlboro, Inc., and 185 Marlborough to 185 Marlboro, Inc. Michael Lilly was treasurer of both companies. On September 26, 1958, the two companies transferred the properties to his brother, David Lilly. On November 3, 1958, 183 Marlborough and 185 Marlborough were acquired by the Chesterfield Realty Corp., of which real estate dealer Edward Swartz was president. On February 25, 1959, Chesterfield Realty transferred 183 Marlborough to Edward Swartz, and on the same day he transferred it to his son-in-law and daughter, Marvin Zonis and Ella Joan (Swartz) Zonis. They had married the previous month. The Zonises lived in an apartment at 183 Marlborough. They subsequently moved to Chicago, where he became a professor on political economy at the University of Chicago and an expert on middle eastern politics, and she became a noted musicologist. On January 12, 1971, they transferred 183 Marlborough into Ella Zonis’s name. They divorced soon thereafter, and Ella Zonis returned to Cambridge, taking the name Ella Zonis Mahler. On November 30, 2001, she transferred 183 Marlborough to the ELN Investments LLC (her daughters, Leah (Zonis) Harp and Nadia Zonis, managers of record). 183 Marlborough remained an apartment house in 2016.